This section of the trip was a total surprise for me. I had no idea where we were going, or what product we were flying, until the (complimentary) chauffeur who had picked us up from a friend’s house arrived at the Sydney airport! 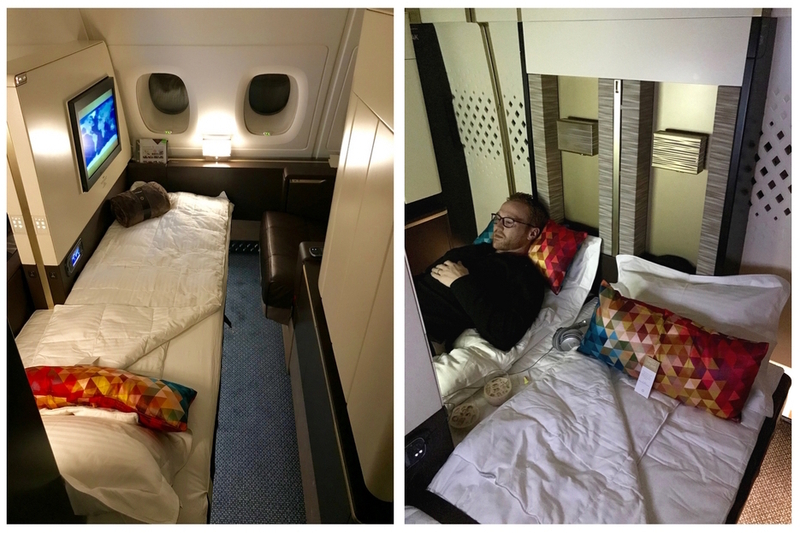 It was then that Alex spilled the beans — I was totally speechless to discover that we were going to Dubai and flying in none other than the famous “Etihad Apartment” for a glorious 14.5 hours! What a surprise! It was probably the best flight I’ve ever been on. 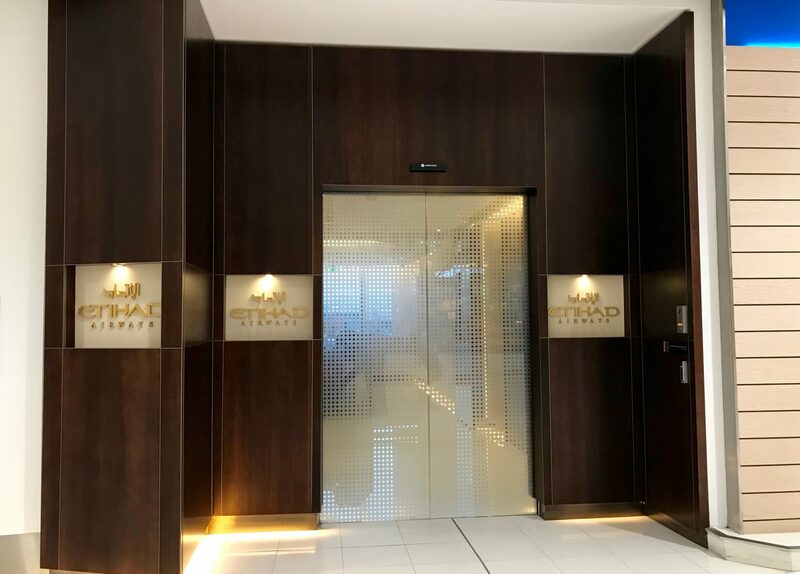 Now — there are multiple ways to book the Etihad Apartment. Some will cost more miles but less in taxes and fees, or vice versa. 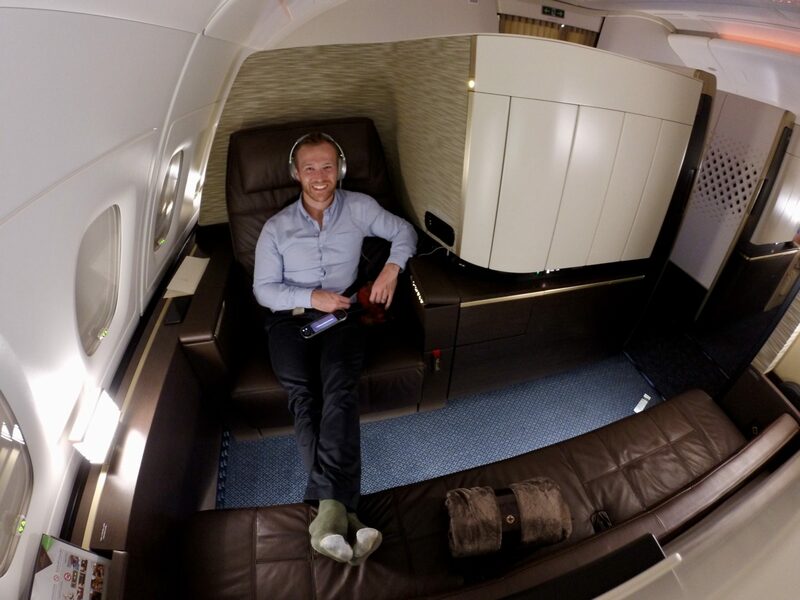 Alex booked this trip by transferring 182,000 Amex points directly to his Etihad Guest Account (Etihad is a transfer partner of American Express, normally at a 1:1 ratio). 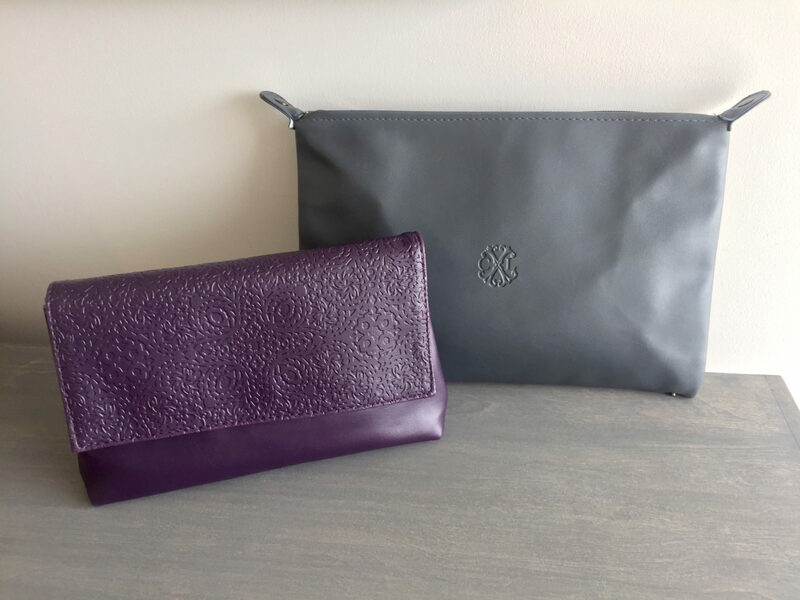 The points were earned from applying for and using The Platinum® Card from American Express and The Business Gold Rewards Card from American Express. Hot Tip: Amex sometimes runs transfer bonuses to Etihad, which have been up to 30% in the past! This means that for every Amex point transferred, you’ll get 1.3 Etihad miles! Unfortunately for us, there was no bonus at the time of booking this trip. For each of us, Alex paid 91,000 Amex points and ~$500 USD in taxes. Not the smallest amount of cash, but considering a cheap economy flight would cost ~$700 per person, being able to fly an unforgettable product like The Apartment for less cash than an economy ticket was quite frankly ridiculous. Alex booked this ticket in the middle of January 2017, which was 10 months in advance. 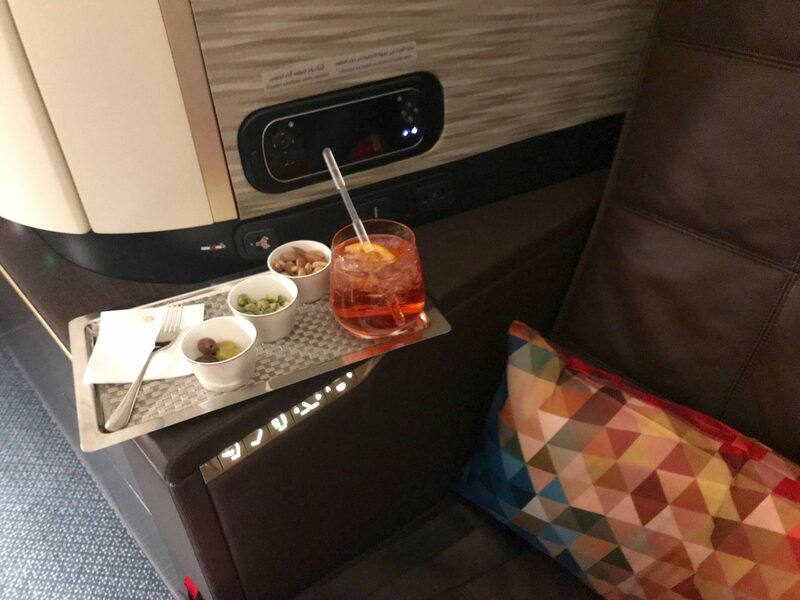 We’ve found that you can snag Etihad first class seats ~4-5 months from the departure date, but for 2 people make sure you plan as far ahead as possible to avoid missing out! The perks of this incredible redemption actually started before the airport. 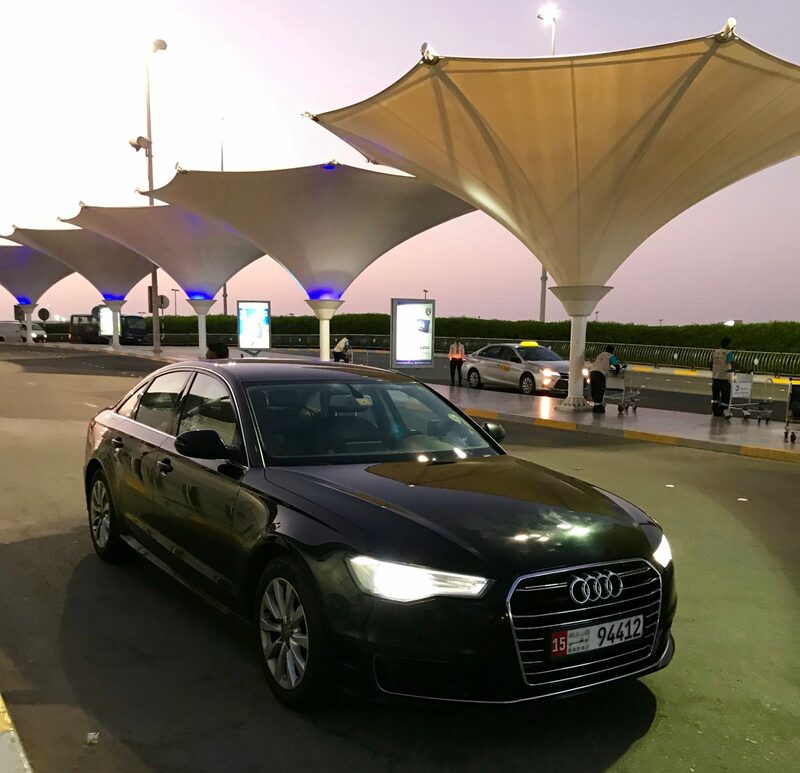 As I briefly mentioned above, Etihad Apartment ticket holders can get a private car to pick you up and drive you to the airport — who wouldn’t take them up on that? Since 1/2 of our traveling duo had no clue where we were headed or how we were getting there, the private pickup was my first hint that this was about to be an epic experience. Just before arriving at SYD, Alex finally chimed in that we would be headed to Dubai via Abu Dhabi, and on Etihad Apartments no less! Shock and awe followed — I was almost too dazed to get out of the car! Check-in was a piece of cake, and we were off to the Etihad Airways First & Business Class Lounge at SYD. We were welcomed with open arms and of course…gin and tonics. 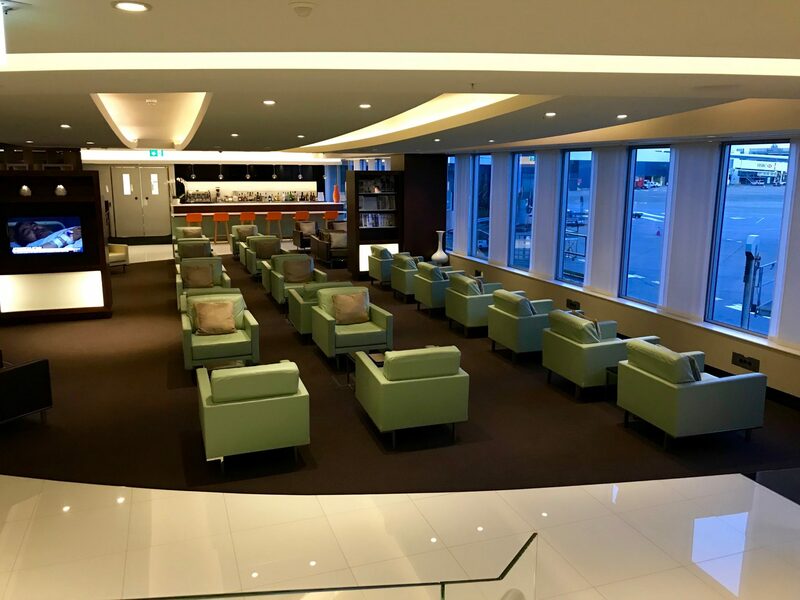 The lounge was large enough and had a great view of the nearby gates, making it a perfect spot to sit and watch the hustle and bustle of planes being loaded/unloaded. Though we didn’t utilize them, there are showers in the lounge if you need a quick rinse. A WHOLE lot better than waiting at the gate! The bites in the lounge were really tasty, including light and fresh offerings as well as more substantial hot dishes. 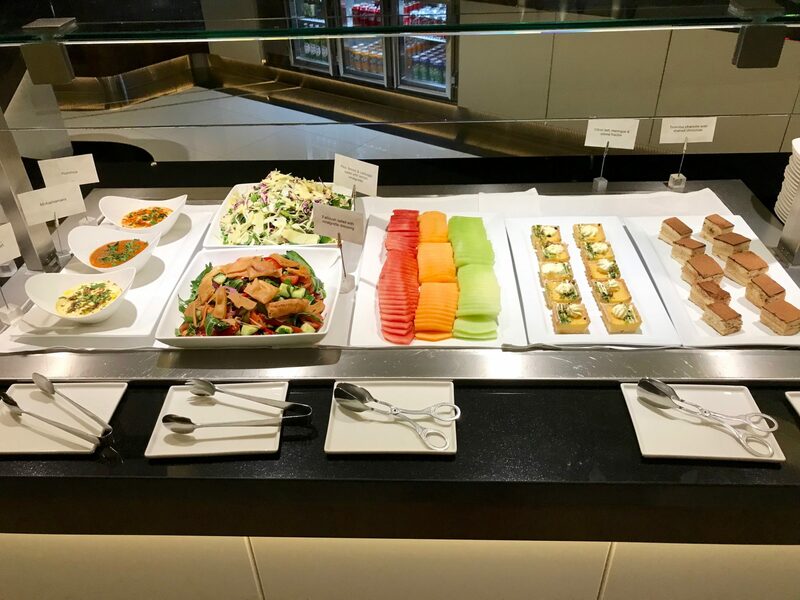 Since food was replenished almost as soon as it disappeared off the serving trays, we basically deduced that the staff in the lounge were magicians! After a short time enjoying the lounge life, it was time to board. Giddiness ensued and we could not wipe the smiles off our faces as we walked down the jetway. Let me tell you…those smiles were pretty much plastered on for the next ~14 hours. The cabin crew invited us on board, greeted us by name and showed us to our Apartments. Yes, our Apartments. More shock and awe…am I dreaming? Each member of the crew came by to introduce themselves in turn, even the chef. We were served champagne almost immediately, then warm hand towels, dates, and traditional Arabic coffee. We were given our pajamas and menus, offered a selection of newspapers and magazines, then pretty much sat there dumbfounded. The Etihad Apartment product itself is unparalleled. There is SO much room (39 square feet to be exact), and it is unbelievably slick and stylish. The Apartment comes with your very own leather armchair (~30″ wide) and a separate daybed/ottoman that converts into a 6’10” fully lie-flat bed. The mosaic patterned pillow ads a great pop of color and nice lumbar support at the same time. Additionally, the armchair itself has a massage function. While it’s not a deep tissue massage, it’s definitely relaxing. Each Apartment also has a vanity with lighted mirror and a full-length wardrobe if you wish to hang your clothes. 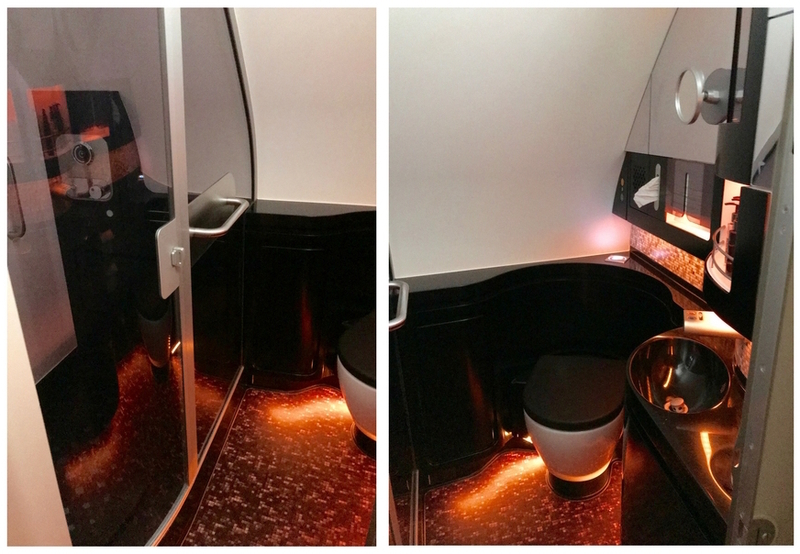 There’s a small minibar that extends out from below your armrest; not that you need it with the amazing cabin crew ready to refill your glass at a moment’s notice. Plus, there are multiple lighting options all controlled at your handset. The 24″ TVs felt massive, and they even swivel for a perfect viewing angle when you lie down in your separate bed. 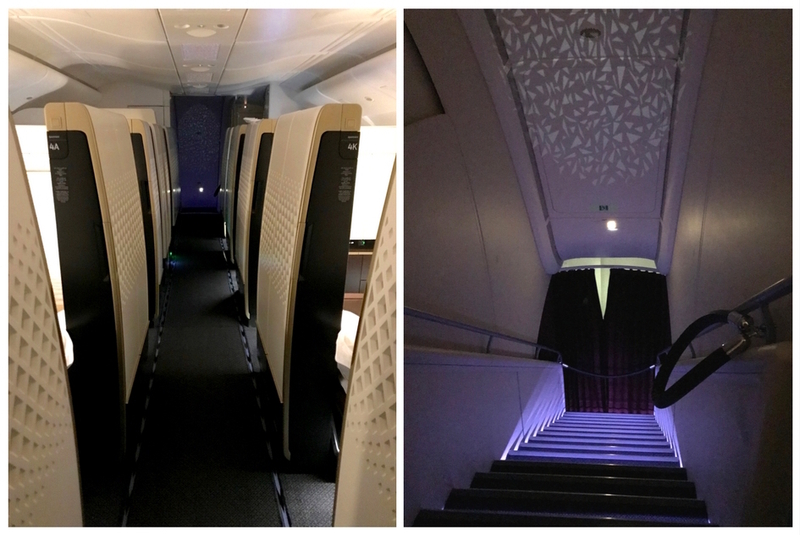 While we didn’t grab a great photo of the dimmed cabin lighting, you can certainly catch the mosaic projection on the forward stairwell…we’re pretty sure we’ll be seeing this aisle in our dreams for a long time to come. 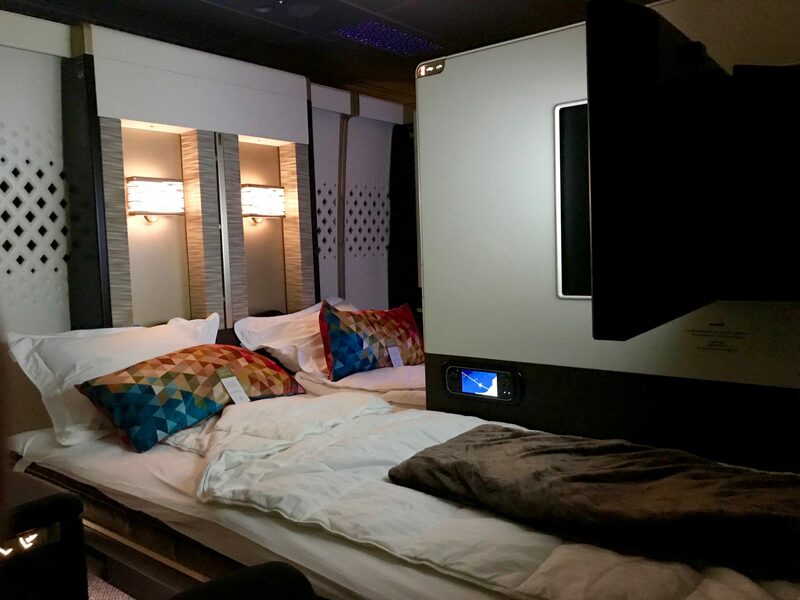 The Etihad first class cabin is located with the Etihad Residence at the front, and in the galley ahead of that are 2 first class lavatories (one being their acclaimed shower suite). Showers are scheduled in advance, so each passenger who wants to take advantage of this outrageous perk has the time to do so. The cabin crew will clean/prepare the suite for you, lay out your towels, and explain how everything works if it’s your first onboard shower experience. Since water supply is limited, the shower itself only runs for 5 minutes (with a lighted timer to help you keep track), but you’re allotted plenty of time in the suite so you don’t feel too rushed. Plus, you can start/stop the shower as you wish within those 5 minutes. 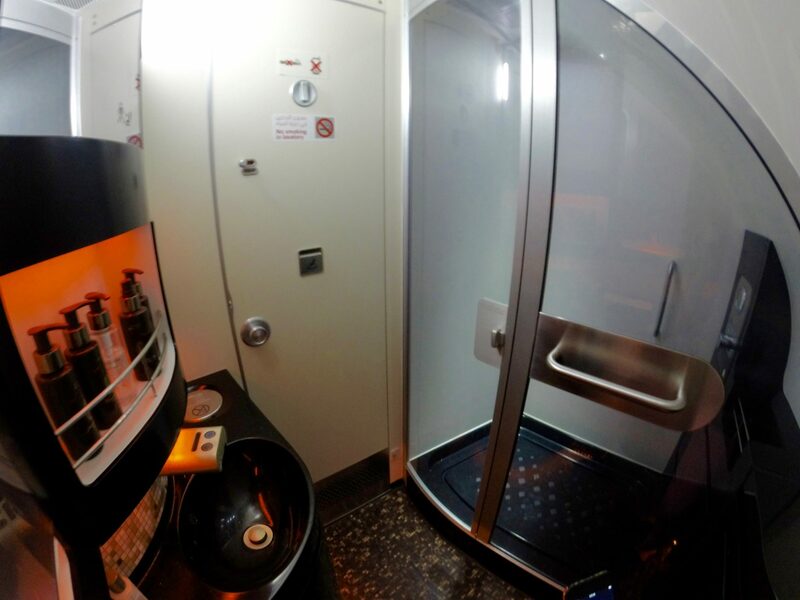 The shower is roomy enough (remember, you’re still on an airplane here!) with a ceiling that slopes downward by the controls. As a practical design element, the showerhead is built into the ceiling so even taller travelers can enjoy it without feeling too awfully cramped. Also, since there are 2 bathrooms for first class, one is free for use while the shower suite is occupied by its designated passengers. Now let’s get back and take another look at the Apartment. Traveling as a couple, you have the opportunity to lower the partition between 2 facing Apartments. By doing so, you can hang out during the flight and essentially share a bed when the beds are turned down. Only half of the partition lowers (since the TV is mounted on the other half), so this isn’t a true double bed like Singapore Suites, but it comes pretty close. 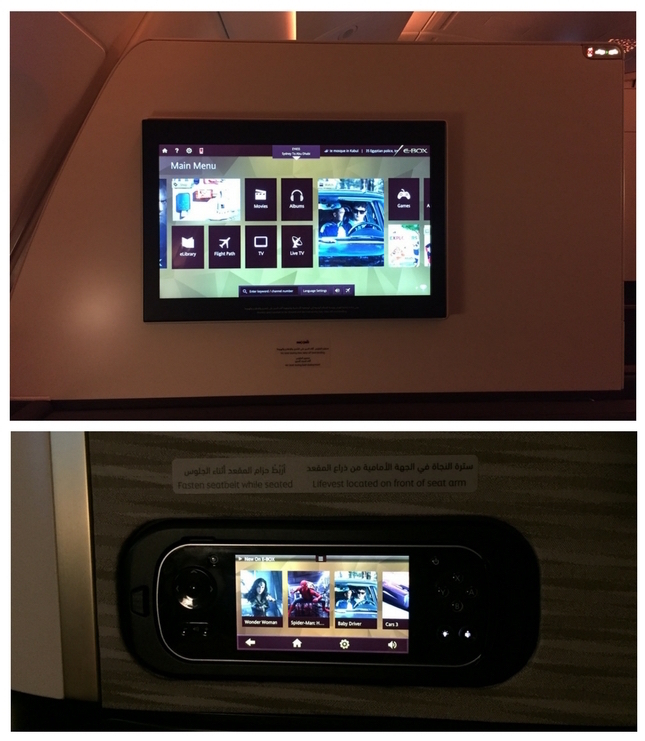 Whenever you request, the cabin crew will make-up your bed and swivel your TV. The fully lie-flat bed comes with an all-natural mattress, duvet, cotton sheets, and pillows. While the bed looks fairly narrow, it was definitely comfortable — we each managed to get a couple hours’ snooze. There’s also a “Do Not Disturb” button on your handset if you’re really trying to keep things quiet. A pretty comfy spot to relax with a nightcap! After take-off, our attendant brought our next beverage. Not only were they great cocktails, but they were huge! Then on to the snack: in the Etihad Apartment you don’t just get a bowl of warm nuts…you get a trio of nibbles including nuts, wasabi peas, and olives! 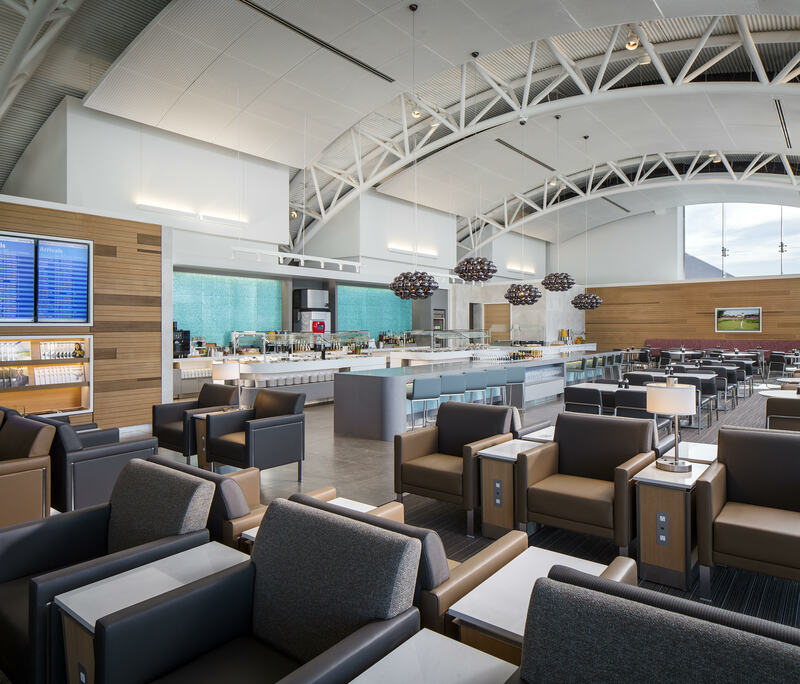 One aspect of this product that really stood out to us was the onboard chef’s interaction with the passengers. Each Etihad chef is fully-qualified and internationally trained. The rest of the cabin crew clearly respect them as well; we heard “Excuse me, chef…” a number of times as they passed by each other in the cabin. Just like with the Singapore Suite, we were able to sit across from each other for dinner. 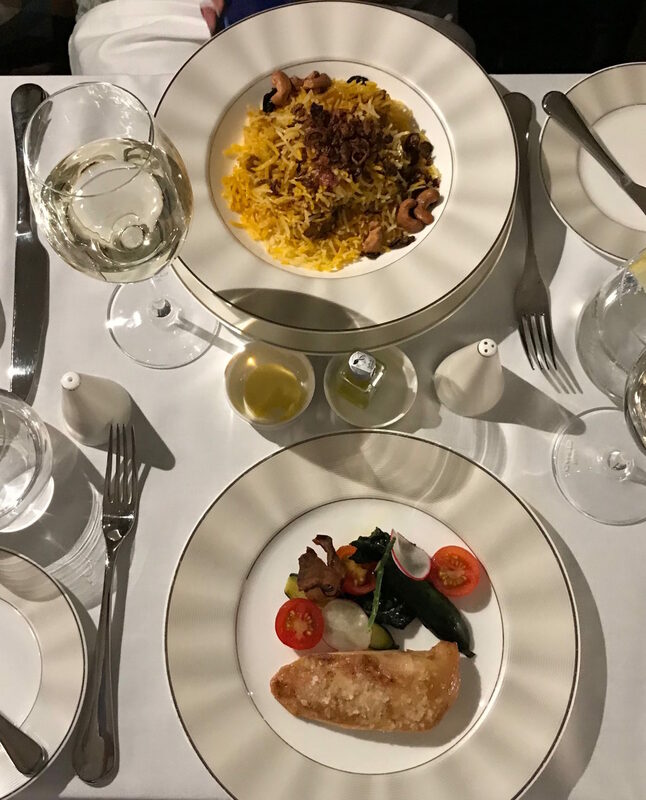 Anytime we can dine together for a meal on the plane, we do — and it was incredible to share this meal together at 35,000 feet! All smiles as we sit down to fine dining in the sky. Of course, there are a number of delicious looking options on the menu. Just in case you don’t see something you like, you can chat with the chef and together create a dish you prefer from any of the ingredients onboard. The duck appetizer was mouthwatering and the Harira soup with pulled lamb was superb. Additionally, after the appetizers/soup, a refreshing lemon sorbet was offered as a palate cleanser before the mains. The chef offered to create Alex a special chicken with seasoned crust and a vegetable medley while I had the chicken biryani dressed with crispy onions, cashews, and raisins — both delicious choices! 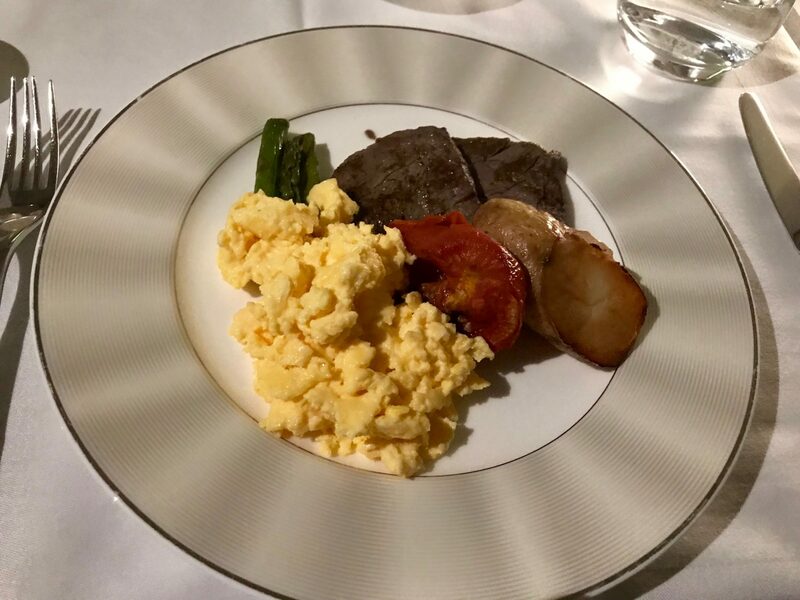 For breakfast, we both enjoyed the steak and eggs cooked to order. 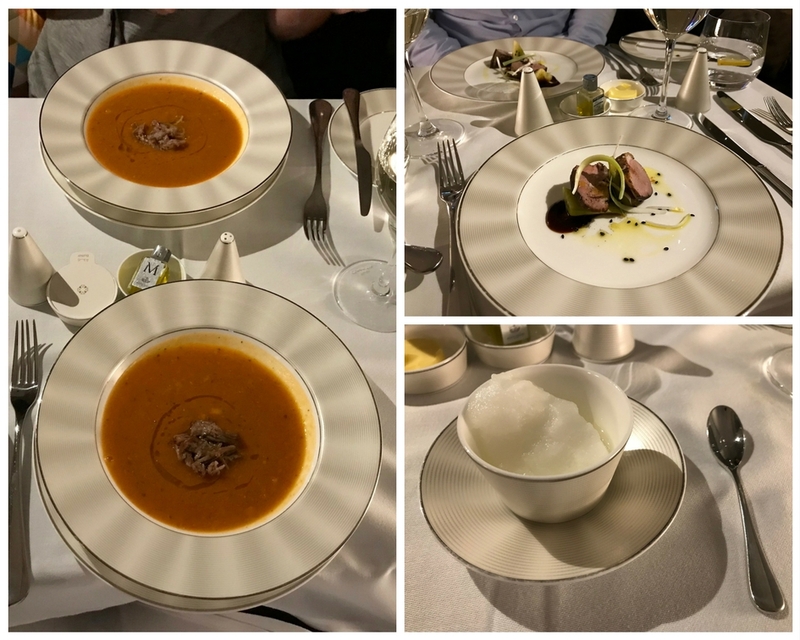 We certainly felt a bit like royalty with so many fancy dishes back to back! 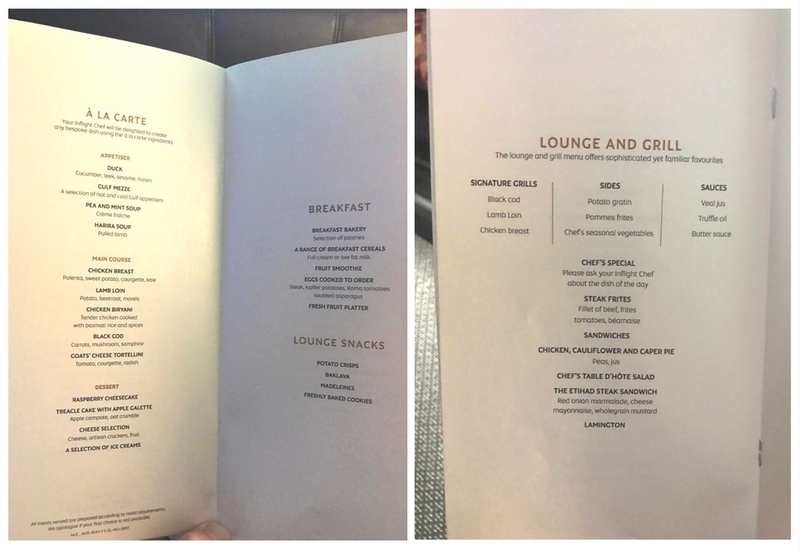 A perfect medium-rare can be achieved at 35,000 feet…Etihad proves it! In terms of amenities, the Etihad Apartment doesn’t disappoint. Within the vanity is your Christian Lacroix amenities kit with luxury skincare products from Omorovicza. This is also the brand of products available in the lavatory/shower suite, and they smell quite nice! So much room to stretch out and relax! 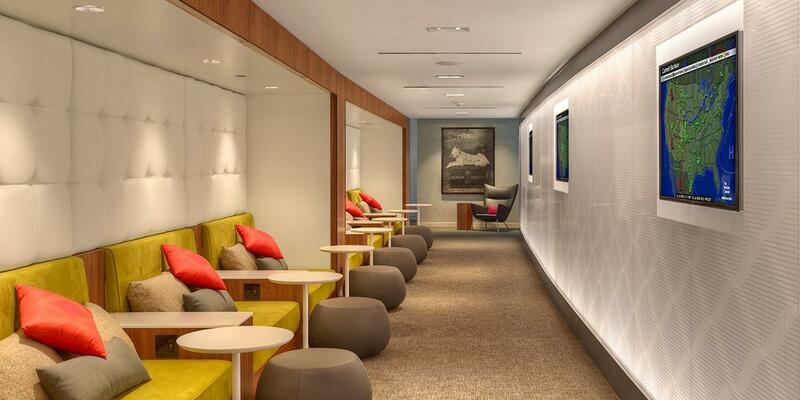 The Etihad Apartment does provide Wi-Fi, but at a cost. It’s technically supposed to work throughout the flight, but we’ve heard there can be brief periods of disrupted service (again, you’re on an airplane here). We didn’t utilize the Wi-Fi for our flight, so I can’t elaborate much in that area. To be honest, we were perfectly happy enjoying the flight without attending to emails! Again, the 24″ TV seemed huge, and with the space allotted in your Apartment, it’s almost like you’ve got your own private theater in the sky. 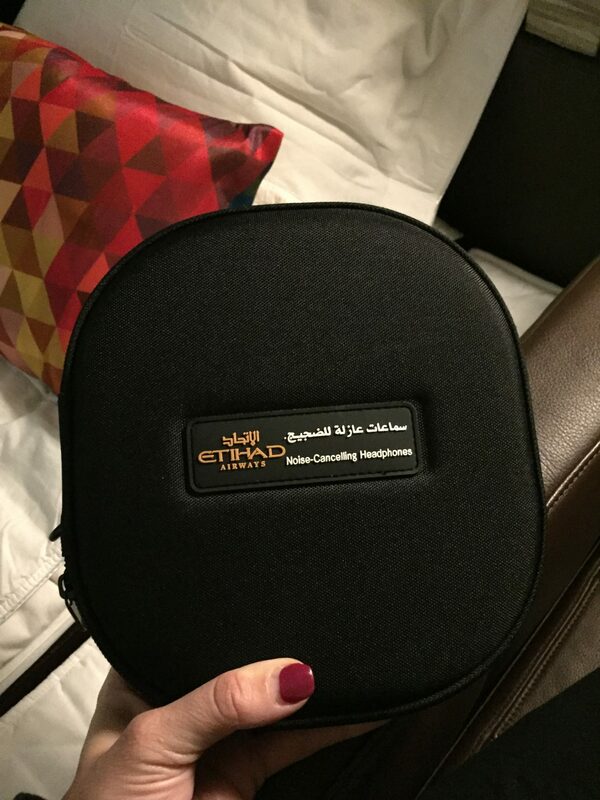 As for sound, passengers are provided with a personal set of Etihad Airways noise-canceling headphones, which work just as you’d expect. We’ll take another moment here to talk about the service on the flight. The Etihad Apartment crew was wonderful! They were warm, friendly, and vigilant without ever feeling too present. Outside of the great service while dining, our crew was quick to offer beverages, snacks, hot towels, turn-down service, etc. This also included advice on most anything from movie selections to things to do once we arrived at our destination. Our specific cabin manager, Narinder, was very congenial and spent quite some time with us discussing where we’d been, where we were headed, and generally chatting about all manner of things. She definitely did a stellar job of making us feel at home in the space. The last thing we’ll mention here is the chauffeur service. Above, we noted that the chauffeur service initially picked us up in a private car to take us to the airport in Sydney. We also elected for this service once we reached Abu Dhabi. The great thing about this choice was our end destination of Dubai itself. Dubai is a 45-60 minute ride from Abu Dhabi, which would have cost us a pretty penny in a cab or Uber! The fact that we had a private driver with a clean and tidy vehicle to drop us off at our hotel doorstep was icing on the cake after this ridiculously amazing 14-hour flight. Can’t wait to fly The Apartments again! 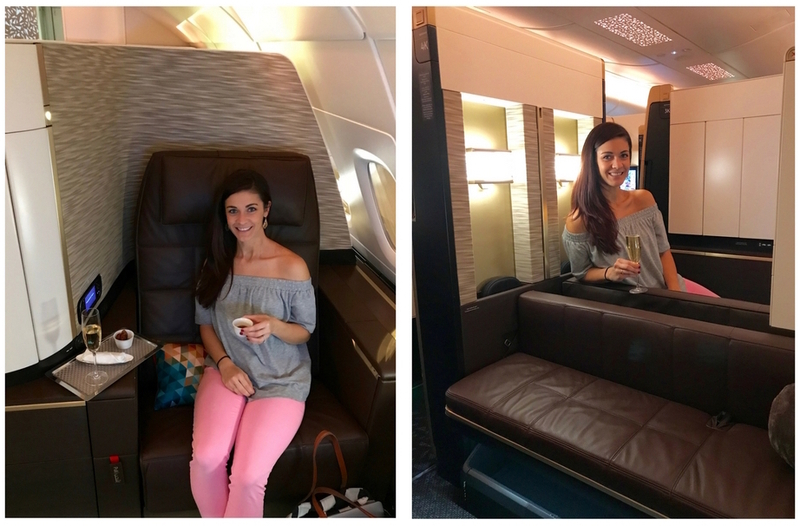 Our Etihad Apartment experience was hands down one of the best flights we’ve ever had. 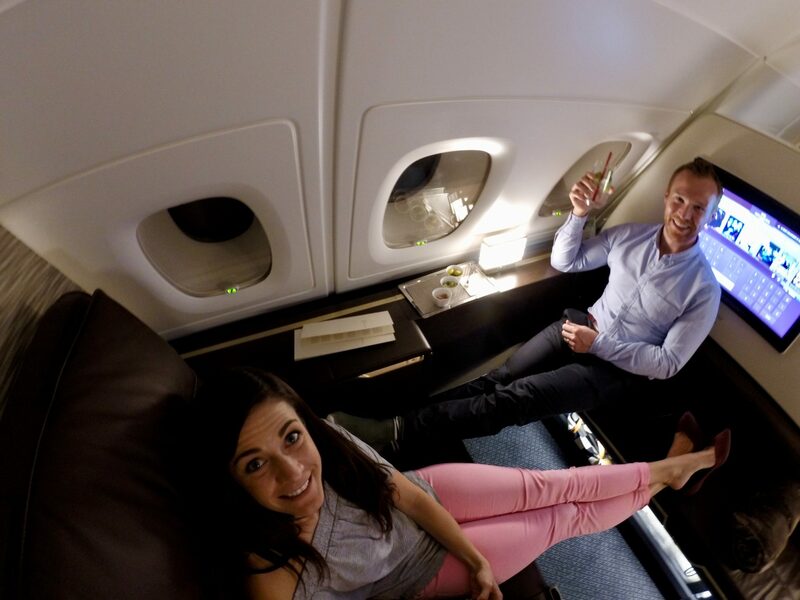 When you combine the ridiculous amount of space allotted for every passenger with the superior service, 5-star dining, ability to shower at 35,000 feet, luxury amenities, and pre/post flight perks…it certainly makes for an unforgettable day! We would redeem points for this product again in an instant. For anyone else wondering, if you haven’t caught our drift already — it’s ABSOLUTELY worth it! How were you able to get first for 91k points? I am looking at Etihad site now at it shows 137k for first guest now. The rates have increased since our time of booking, by about 12-15k I believe. I also decided to use Etihad’s feature where you can purchase up to 25% of the miles needed for an award flight (which results in you buying miles for 0.9 cents which is amazing). So, that reduced it down to 91k too. Lastly, even though the rates have gone up…be on the look out for Amex > Etihad transfer bonuses. These have been 30% in the past and that would save a lot of miles and certainly bring it back to the prior rate, if not lower. Beautiful documentation!!! May i know what camera or 360 degree camera that you use for the photo with the caption “This. Product. Right. Here.”? I am flying this coming September and am so excited. Thank you for the compliment 🙂 We used the trusty GoPro and would certainly recommend it for snapping cabin pics etc! This has to be the coolest plane ever, it looks like a modern lounge. 1. Just wondering, the flight was 2017, but article was only recent – could you maybe supply some updated point awards? 2. I’ve wanted to create a blog on our travels from years ago, but afraid of the time it takes – how long does one article take? 3. Looks like you booked directly with Etihad. I see the crazy 1M+ points, etc. Plus there’s “First class” and “The Apartment”. Isn’t one supposed to book “The Apartment” (2M+ points)? 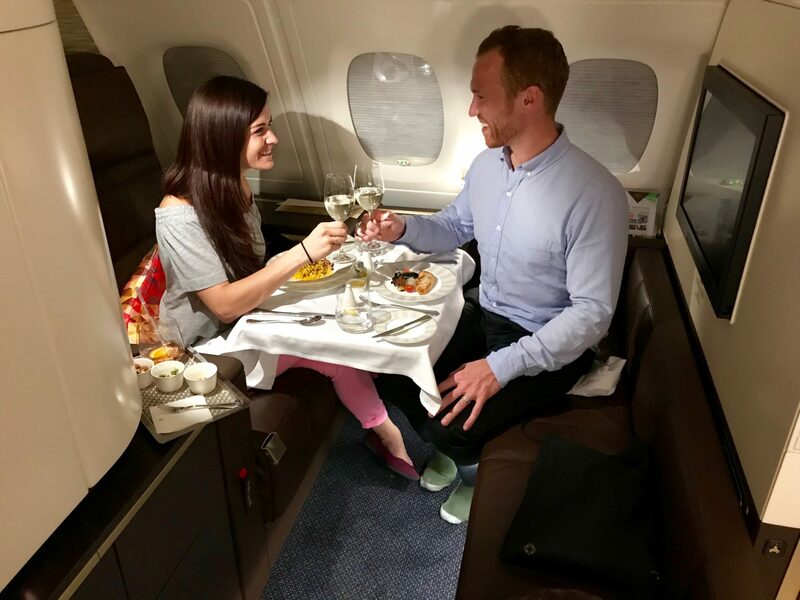 I see similar options with say Business/First milesAAver vs First – do you book the Business and hopefully get the First class part? 4. Is AA still viable way to book the Etihad 115K one way (meaning “First” or “The Apartment”), or JAL 120K? Thanks! And I was looking at booking a trip to Copenhagen (CPH)! LOL. 2. A great, detailed article typically takes 8-10 hours. 3. 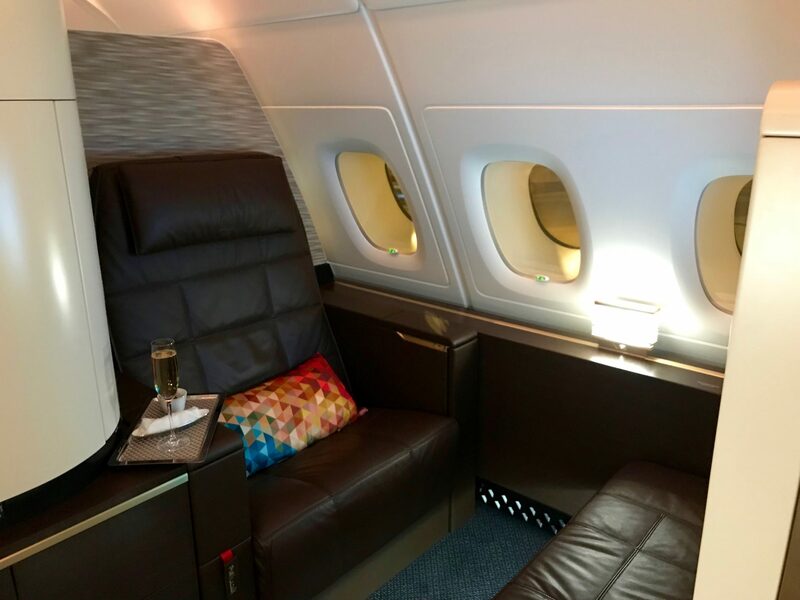 The challenge with Etihad Guest is finding awards that don’t cost an astronomical amount. This is their most expensive award. The “saver” awards are around 100,000 miles one-way. Once you find that availability, you can contact American Airlines or your preferred partner to book. 4. Yes, AA is currently still one of the best ways to book Etihad.